A beach is not my idea of an art gallery, particularly not a cold, rain & windswept English beach in early winter. But that's exactly what Crosby Beach north of Liverpool on the Lancashire coast is. Between Liverpool and Southport, Crosby looks out across the River Mersey estuary to Wallasey on the Wirral Shore and beyond to North Wales. The beach is home to 'Another Place' - a modern sculpture depicting 100 male figures stretching along 3 kilometres of foreshore. 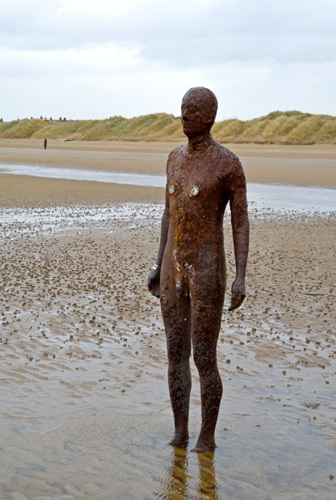 The work of London born artist Antony Gormley, the cast-iron figures are all replicas of the artists body. Standing 189cm (6 feet 2 inches) tall and weighing 650 kilograms (1400 lbs), the 100 pieces took 3 weeks to lift into place anchored firmly on metre deep foundations. 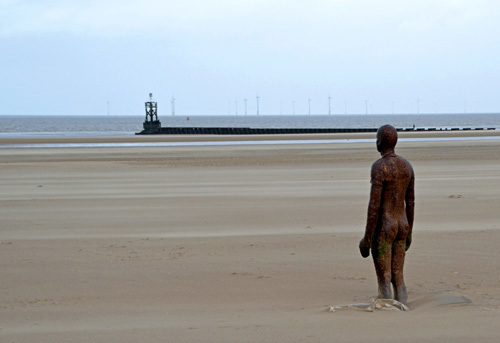 According to Gormley, the work is meant to "harness the ebb and flow of the tide to explore man's relationship with nature". Initially the centre of divided public opinion, including claims they were pornographic due to the inclusion of stylised genitalia, but the locals have since taken the statues to heart, to the extent they're frequently seen dressing them in various pieces of clothing. Cast at two British foundries, Hargreaves of Halifax, West Yorkshire and Siddons of West Bromwich the work was first exhibited on another beach at Cuxhaven, Germany in 1997 and then Stavanger, Norway and De Panne, Belgium before arriving at Crosby in 2005. Originally, the Iron-Men were intended to move on to New York in 2006, but locals petitioned strongly for them to remain in Crosby permanently. With that the local Coast Guard became involved expressing fears that visitors to the site would be caught-out by changing tides and trapped in soft sand. Conservationists also complained that local bird-life would be impacted by increased tourist traffic and in October 2006 Sefton Council refused permission for a permanent display. 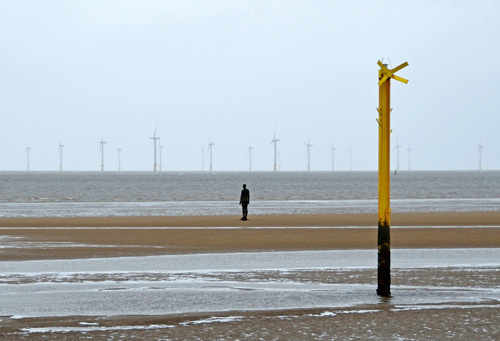 Antony Gormley joined with many locals in denouncing the Council decision. A management committee was set-up to campaign to keep the display and eventually on 7th March 2007, citing international public & media support and follow-on benefits which would be felt for many years, the Council reversed its original decision. The permanent display of the figures stimulated further improvements in the area including plans to develop a Mersey Observatory, redevelopment of the local marina and the establishment of the Crosby Lakeside Adventure Centre. 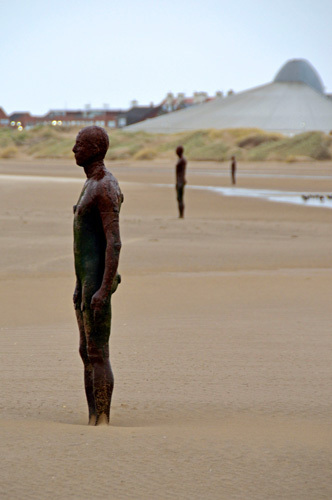 The Iron-Men make Crosby Beach an intriguing place to visit but I strongly recommend you do it in summer. Is this a permanent feature, or temporary?